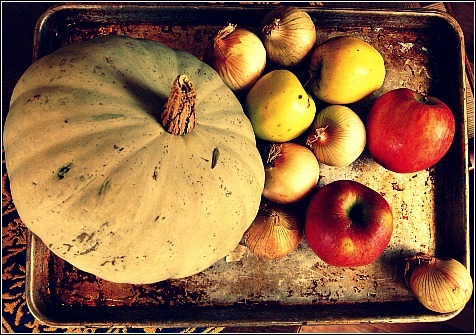 Kitchen still life: a pumpkin, apples and onions resting before roasting. The rain has returned, along with the pelt-thick socks on my feet and the woolen cocoon I call my favorite sweater. Since I keep my home thermostat at 60 degrees, proper layering and refueling are a must. With insulating layers good to go, I turn to soup to reheat me from the inside out; and my favorite is a creamy rib-sticking roasted pumpkin soup. 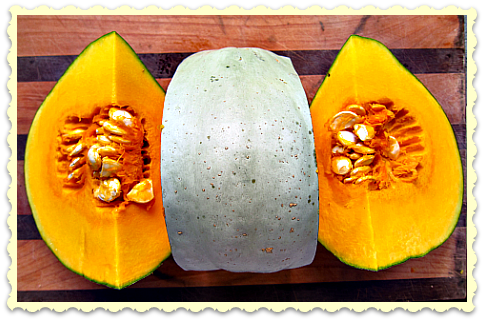 Sweet meat squash, pale green on the outside, golden delicious on the inside. 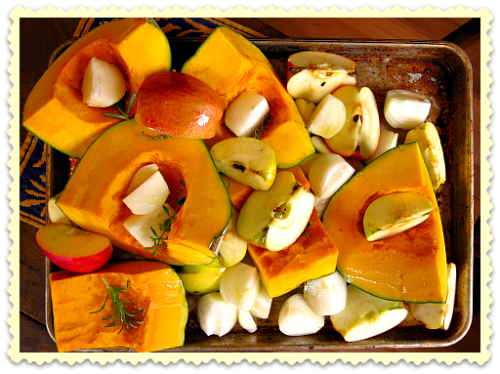 A cornucopia of great fall flavors ready for the oven. Roasting really brings out the flavor. This soup can be adapted easily to include your favorite fall fruits and vegetables in addition to the mainstay pumpkin. I like sweetness added by roasted apples and/or pears. For a change of pace I’ll add Thai curry paste to the soup for a spicy kick. I’ve also experimented adding adobo or mole paste for whole different twist. Heat and with hand wand or in a blender puree until smooth. Run the mixture through a sieve or strainer for a creamier soup. If you’re feeling fancy, sprinkle roasted pepitas (pumpkin seeds) and croutons on each serving. A soup so tasty, I eat it all week–make that all fall and winter (and it freezes well too). Trust me, you should make this soup. Would this pumpkinhead steer you wrong? I think not. 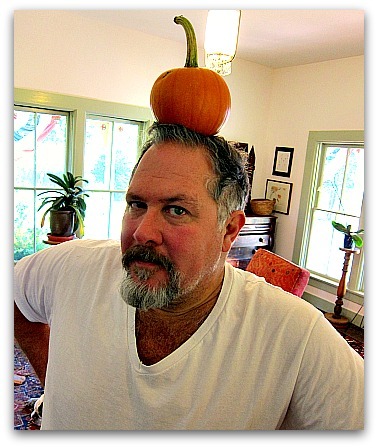 Previous articleGreat Pumpkins: Eye Candy and Great Eating! Next articlePumpkin Pie Judge: Best Job Ever! Oh my. I think I actually have everything, most grown in Everett. The last of my apples are ugly, but I don’t think the pumpkin wil mind…. 60 degrees? I thought I was tough at 63. You da man! Wow – this looks fabulous! I love your idea of roasting the veggies for more flavor and as for adding mole paste…well, I’m gonna’ try that pdq. I think it’s a perfect idea. Oh gosh darn Tom – you are too cute for words! I don’t get around to trying many recipes but I love your blog and check it frequently. I like having another friend in the pnw. I live on Bowen Island, off vancouver coast. Gorgeous sunny day today – sending you wishes for a Happy U.S. Turkey day! Thanks Lea Ann, I’m blushing. Bowen Island must be quite a lovely place if a stone’s throw from Vancouver. Thanks for the holiday wishes, I’m currently figuring out what pies to make for Turkey Day. This soup sounds delicious Tom. I love the Thai flavors in this soup – and so healthy for you too! I thought it said wave your wand ( makes for more interesting reading when you get older) But I do like the picture in my mind of you waving your wand over the soup pot. Penny, I’ve never grown Hubbard squash, but that doesn’t mean I can’t start. Looks like the pumpkin patch just got a little bigger. Donna, I feel like I’ll be spending Turkey Day at your table. Hope you enjoy the soup and pie! Looks absolutely delicious! 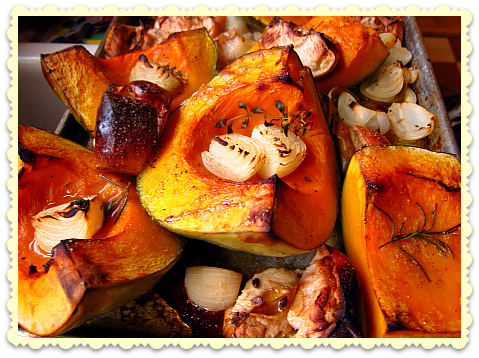 I can just imagine how good my kitchen would smell with all of these veggies roasting in my oven. Another recipe on my must-make list! Oooh,..What a lovely roasted soup! roasting apples too, brings out so much of their flavours! This is a wonderful & very superb soup! MMMMMMM,…Lovely pics too! I miss your posts- love the sound of this recipe and I also appreciate the alternative ingredients.Okay now..60 degrees? Come on! You are a machine! I’m so impressed.Please post more pictures- especially all you guys in your keeping -warm attire. Big hugs! I’m sure it’ll be beautiful! Best. Just finished making a pot of your pumpkin soup with a cinderella pumpkin. Yum! I did not have any coconut milk so I melted a wee bit of coconut oil into the pot. That with the curry paste, I simply cannot get enough! Thank you Tom! Might I add, super delicious! I used a Kuri pumpkin. Your pictures are exceptional on this post. I get my fill just by enjoying them.